Contactlenses.co.uk reaches it’s 3 millionth customer. Contactlenses.co.uk thanked customer number 3,000,000 this week. To celebrate, contactlenses.co.uk supplied their 3 millionth customer with 6 months of contact lenses and a bouquet of flowers, also as a way to say thank you to all of their customers they planted an extra 10,000 trees with help from their partners Trees For the Future, bringing their total number of trees planted to date to 116,477. 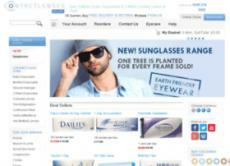 Contactlenses.co.uk has been successfully despatching contact lenses and now sunglasses to customers for 15 years. As a fast growing and established internet contact lens retailer, contactlenses.co.uk prides itself on it’s number 1 position on Trustpilot with a score of 9.7. “It’s our great customer services and prices, plus the fact that we are the only online company to despatch all of our orders in the UK free of charge, that keep our customers coming back” she said.